Located 150 meters from the sea with unspoiled views of the Mediterranean from every room. Built on the urbanization of Nerea, the property is located on 2 floors about 1km from the centre of Peñíscola. Relax on the large balcony, by the pool, on the beach or the roof terrace. Wake up to your favorite TV programs with UK satellite and DVD players in each bedroom. Enjoy golf, sailing, windsurfing, jet skiing, quad biking, cycling or tennis which is all available locally or take a day out for shopping or adventure to Barcelona, Valencia visit the Universal Theme Park, Benicassim Aqua World or the natural heritage of the Ebre Delta. Whether you’re a family or couple looking for relaxation or activity, Peñíscola and the surrounding area are a beautiful location to spend your holidays. High speed free Wifi internet also available. Parking spot in Garage under apartment complex. Private Wifi. Password key will be given by Sandra and Martin on arrival. Outside only on Balcony. No smoking inside. Onsite there are 2 communal swimming pools and child’s pool, restaurant, bar and grocery shop. Basic free-to-air channels in the lounge and bedrooms including radio. Spanish and Germany TV are sometimes available, but cannot be guaranteed. There is also a DVD player in the lounge & bedrooms. The apartment is on the top two floors of a 3 floor apartment block, with unspoiled views of the sea. The first floor comprises of a lounge/ dinning area with large balcony terrace, fully equipped kitchen and restroom. The 2nd floor has a large bathroom & two bedrooms. The master bedroom has on-suite facilities and a private balcony. My wife and I stayed in the apartment for three weeks in March 2018. Whilst we wouldn't describe it as a luxury apartment (these things are subjective of course), it is really nice and we enjoyed our stay. The apartment is accessed by two short flights of steps and during our stay we felt secure. The views from the apartment are super, overlooking the Med.. The TV in the lounge offers english-language channels Sky 1, Atlantic, etc and the newly installed broadband router gives good access to the internet (we were able to watch UK TV on our two Tablets simultaneously without buffering) and could of course listen to BBC radio. Car parking is excellent. The car park is situated below the apartments with an allocated parking space. Entry and exit is controlled by a key-fob transponder. There is also some limited on-street parking available. The owner doesn't live in Spain and the apartment is "managed" by Martin and Sandra who live very close by. On our arrival, the apartment was immaculate (best we've seen in 15 years of winter visits to Spain) and its clear they take great pride in what they do. Two nice people for whom nothing was too much trouble. Everything you need for a pleasant stay is provided. We found the bed to be ultra comfortable (incidentally, the wifi reception was also good in the bedrooms) and the heating was very good (not really needed during the day but a boon later on in the evenings bearing in mind it was March). So, all in all a very pleasant holiday in a nice apartment situated on a safe and well presented urbanization just a few minutes drive from Peniscola (under 5 minutes by car). Dear Neil, thanks for your comments! Happy you had a great holiday and Sandra and Martin made you feel welcome. Glad the heating was suffice during the colder winter evenings, know all well how cold winter in Spain can be when the sun goes down. Will ensure Sandra and Martin see your comments, I know the go above and beyond to ensure everyone has a great stay. Look forward to welcoming you back with our returners discount. Best regards. The unit was unbelievable, everything in the description was intact. Views of the ocean, sunset with a glass of wine on balcony. Romantic walks along the coast and hikes also. Two floors with TVs and DVDs in each room. Satellite TV needs work, something wrong every night cuts in and out, though not in Spain to watch TV. Internet is slow. Will stay again when we can. Thanks for your comments, glad you had a nice time Think you stayed in April 2017? We are working with a local provider to add better internet in both my apartments for 2018. UK Satellite TV is a challenge at night in Spain and unfortunately not much we can do. Please reach out before booking again, to ensure you receive my returners discount. Just returned from Spain and Scott's apartment. Excellent location with views out to the bay. Quite location, with a few English couples around to talk to. Car is best option, taxis are expensive and hard to find, though only 20 minute walk from the told town to the apartment. Will book again for next year for sure. Price is good for space and location. Excellent apartment. Lots of hot water for showers when you wanted it. Facilities very good, Sky T.V. etc. However, beds were a bit uncomfortable - although this seems to be standard when you go away. Swimming pools good. Restaurant/bar O.K. Nice quiet area. No on-site supermarket. Views from apartment excellent. Need a car to get to the good beaches. Would consider returning. Both bedrooms will be totally refurbished during the winter, this will included replacing the bed mattresses with a more comfortable product. We stayed in Peniscola at this apartment for two week, the apartment is perfectly positioned with wonderful views of the sea from all windows. The apartment is decorated well with TV, DVD in each room and Satellite TV, though the signal does breakup at night from time to time. Would recommend a stay and will certainly be booking again. La location se situe dans une très belle résidence,bien entretenue et au calme.La vue donne d'un côté sur la mer et de l'autre sur la montagne. La location bien que décrite comme un appartement,fait plus maison.A l'intérieur,elle dispose de tout le confort nécessaire.Le prêt des draps et serviettes est un vrai plus et nos lits étaient faits à notre arrivée,ce qui est vraiment très agréable.La location est propre,bien entretenue,spacieuse,on se sent chez soi. 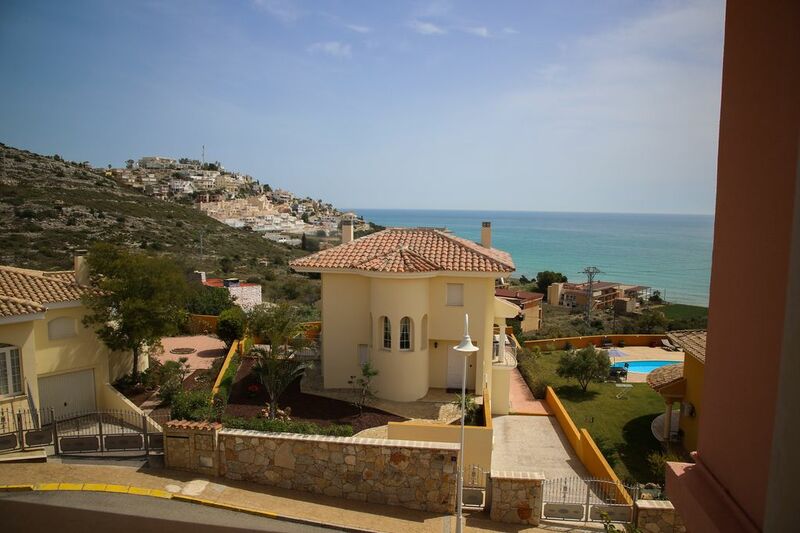 The Property is located about 1km from the centre of Peñíscola, on a natural viewpoint over the sea, very close to the water. The old town of Peniscola is very picturesque - built on a peninsula. The centrepiece is a medieval castle which was occupied in the 15th century by rebel pope, Benedict XIII. The streets are cobbled and narrow. There are lots of restaurants, shops and miles of beaches. Change over day is normally Saturday, if this is not convenient please check and I will try my best to accommodate if possible. For longer rentals out of season please contact me about prices Rentals of 7 days or less incur a cleaning charge in the low and medium season, this is paid locally.